This replacement Tail light is just what you need to get your Honda CR-V in good looking form again! The (VIN) number can be found on your vehicle registration or under the windshield near the driver's side front "A" pillar post. We have noticed that there are many inferior quality Tail lights on the market. We have researched other tail light manufacturers and are only selling what we believe to be the highest quality, best fitting, aftermarket tail lights available. So don't be fooled by cheaper made imitation tail lights. Go with superior quality! This Honda CR-V taillamp makes a great replacement and has good cost savings over a dealer Tail light. Pry out the two plugs to uncover the bolts. Twist the sockets out counterclockwise. Pull the bulb straight out. Push a new bulb in. Twist the socket back in. Remove the Panel, table, spare tire and the panel below the spare tire. Remove the clips on the panel near the bumper. Remove the Panel. Remove the Phillips screw by the taillight. Remove the jack cover. Remove the jack. Pry out the inner panel. Pull the grommet out and pull the light off. Push the rubber grommet in. Line-up and push the light into place. Replace the jack and the jack cover. Replace the Spare tire, panels and table. Replace the two 8mm bolts. The detailed video 1A made for installation earned my business. And on the phone they assured me that it would match perfectly - which it did. Made a little driving mishap go away. 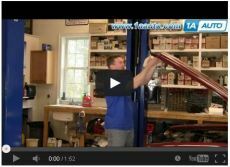 Excellent quality, perfect fit, easy installation, great instructional video. Thanks! Honda tail light was perfect fit and works great!